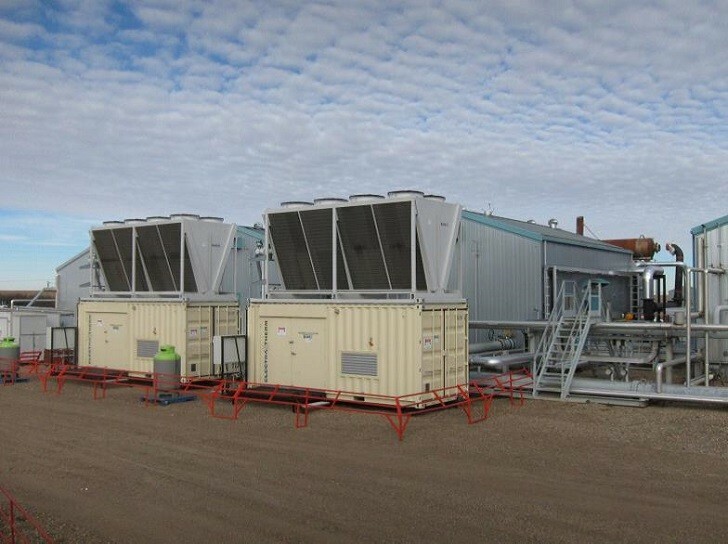 ElectraTherm has partnered with ConocoPhillips to install two Green Machines at a natural gas compression station in Cessford, Alberta, Canada. The two Green Machine 4400s, ElectraTherm’s ORC generators producing electrical output up to 65kWe each, run in parallel off the waste heat of a Waukesha 7042 natural gas engine. The waste heat generates approximately 90kWe gross of fuel-free, emission-free electricity at the site. The Green Machines were installed in the first quarter of 2014 and have each exceeded 2,000 hours of run time to date. They are remotely monitored from ElectraTherm in Reno 1,200 miles away. These Green Machines represent ElectraTherm’s first commercial units that are CRN and CSA approved for Canadian deployments. Exhaust heat from the natural gas engine is converted to hot water and added to the jacket water heat through an engine glycol cooling loop combined with an Aprovis exhaust gas heat exchanger. The waste heat enters each Green Machine at 230°F (110°C) and 180 GPM (11 l/s), where it’s converted into usable onsite power. This specific site was retrofitted into an existing compressor using an engine driven radiator/gas cooling system. Future deployments of the ORC system could be configured to replace the existing radiator/gas cooling system with the Green Machine and a dedicated electrical cooling system. This frees up engine horsepower for compression and provides power for local loads while eliminating the cost of a conventional engine radiator. The ORC system becomes a power producing radiator with a payback. ElectraTherm’s Green Machine generates fuel-free, emission-free power from low temperature waste heat on applications such as internal combustion engines, biomass, geothermal/co-produced fluids and solar thermal. ElectraTherm’s Green Machine fleet has accrued more than 225,000 hours (25 years+) of runtime to date.